Swimming is great exercise for any age. In fact, swimming is often recommended for people with joint issues, pregnant women, and as an alternative form of exercise for athletes who want to stay active while also letting an injury heal. Aside from all the physical benefits you can get from swimming pools, let’s not forget the most important one: swimming pools are fun! If you are looking into something a little different and unique for your swimming pool, our team at Lake Norman Signature Pools & Patios wants to help you make the most of your custom swimming pool. Custom swimming pools should work with your needs and wants– not the other way around! Before determining the size and shape of your custom swimming pool, however, you’ll need to decide how you want to use your custom swimming pool. Will you be using it primarily to swim laps? For fun play with your children? Just a place to hang out and relax? 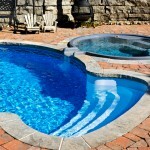 Whatever your reasons for getting a pool, your custom swimming pool should mold to match those needs. Unless you have an unlimited budget, you’ll need to be savvy when it comes to the building and installation of your custom swimming pools. Because in-ground pools can be made from fiberglass, concrete or vinyl liners, you’ll have to decide which of these will best fit your needs and budget. Concrete works well for uniquely shaped pools, but also takes a long time to install and cure. Fiberglass and vinyl liners come in limited sizes and shapes, but are cheaper and easier to install, so you could be swimming sooner. It all depends on your priorities!